P hytoplankton-bacteria relationships are mediated by chemical interactions in the phycosphere, (the region extending a few hundred micrometres from the surface of a phytoplankton cell where the diffusive transport of organic-rich phytoplankton exudates creates a zone where bacterial growth and nutrient remineralisation is enhanced). This cocktail of chemicals can act either as attractants and substrates for bacterial growth, or as infochemicals that underpin antagonistic or mutualistic relationships; in other words, they can direct marine social networks. T hrough combining cellular physiology and biochemistry, microbial ecology, molecular biology, marine chemistry and oceanography, we investigate the role of DMSP in phytoplankton-bacteria interactions, at both the scale of cellular interactions and across regional oceanographic features of the Australian marine environment. 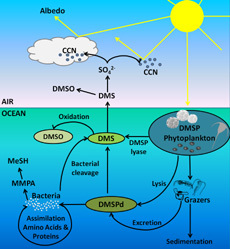 This project aims to reveal how stress-induced shifts in the physiological condition of phytoplankton alter DMSP production and determine how shifts in DMSP production influence phytoplankton-bacteria interactions at the microscale. Through collating data from an ocean time series and oceanographic voyages we aim to identify patterns, and reveal key environmental drivers, in the production and transformation of DMSP in Australian waters. 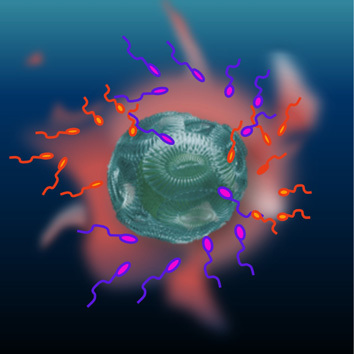 Artists interpretation of E. huxleyi phycosphere attracting bacteria. Schematic of DMSP degradation in the ocean.